Fri, Apr 12, 2019, 07:49 am SL Time, ColomboPage News Desk, Sri Lanka. 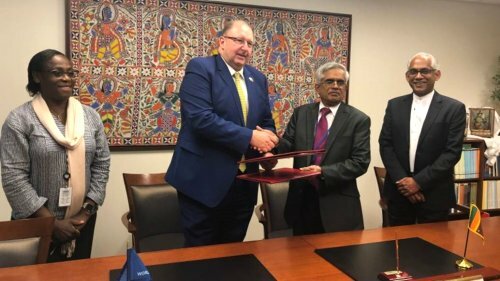 Apr 12, Washington, DC: Sri Lanka and the World Bank Thursday signed two new agreements worth $150 million to improve climate resilience and agriculture productivity for small farmers and support priority infrastructure through public-private partnerships. Hartwig Schafer, World Bank Vice President for the South Asia Region and Dr. R.H.S. Samaratunga, Secretary, Ministry of Finance signed the agreements on behalf of the World Bank and the Government of Sri Lanka respectively, World Bank said in a statement. The signing took place during the World Bank Group and IMF Spring Meetings 2019 in Washington, D.C., in the presence of State Minister of Finance, Eran Wickramaratne. The new projects include a $125 million credit for the Climate Smart Irrigated Agriculture Project, which will improve the resilience and productivity of agriculture for more than 470,000 small farmers in 6 provinces in the dry zone of the country and a $25 million loan for the Framework Development and Infrastructure Financing to Support Public-Private Partnerships Project, which will help the Government of Sri Lanka develop a platform to attract and sustain investments required to fulfill its future development priorities. "Sri Lanka is on a path to becoming an upper middle-income country," said Hartwig Schafer. "To ensure that this growth is sustainable, affordable, and resilient, the two projects are designed to leverage private sector financing for infrastructure and address climate vulnerability in the agriculture sector." "The project will support farmers' access to training and research. Currently, only 10 percent of women benefit, and this project will help bridge this gap and improve productivity of both men and women working in agriculture" said Idah Pswarayi-Riddihough, World Bank Country Director for Maldives, Nepal and Sri Lanka. "Innovation, including the introduction of improved crop varieties, cropping patterns, water resources management, amongst others, can help farmers adapt to changing climate and improve their incomes and livelihoods."